You know, it can be difficult to remain true to your deepest convictions and live life on your own terms. But I think we can all agree, it’s always better to be yourself and follow your dreams rather than end up with a lifetime of regret for all the things you didn’t do. It’s easy to lose sight of what’s really important, and those are the times when you have to turn inward, to an unshakeable place deep within you, and remind yourself that worrying about what other people think of your war crimes is no way to spend your all-too-short time on this planet. It’s human nature to try to please people, but you shouldn’t let others make your decisions for you. If you rely too much on the validation of others, you may never feel confident enough to open up that small business, go skydiving, or authorize sarin gas attacks against your own people. You have to do these things for yourself and no one else, and if mass atrocities are what’s truly in your heart, why should it matter what other people say? Look at it this way: If you spend all your time fretting over what someone thinks about the genocidal acts you’re trying to commit, you’ll never get around to committing them! But it’s not easy to rise above the naysayers, believe me. For the longest time, I would second-guess myself whenever a human rights organization criticized me for dropping barrel bombs in densely populated areas, or partnering with brutal militias to indiscriminately slaughter civilians. Even though I knew, more than anything, that I wanted to kill tens of thousands of people, I let all that negativity get to me. I ended up doubting myself, and I’ll admit, I came this close to not murdering those innocents at all. Can you imagine? It took me a long time to make peace with the fact that someone is always going to judge me for secretly imprisoning and torturing more than 13,000 people or starving thousands of children to death. No matter how hard you try, you’ll never make everyone happy—not your family, not the U.N. Human Rights Council, not your friends. So why even try? Tune out all the critics at The Hague and just do you. Take, for instance, hitting non-military targets with double-tap airstrikes to maximize casualties. When the doubters start chiming in as usual, remember that they’re not living your life and they don’t have a claim on your happiness. If every time I was about to commit a massacre I thought to myself, “Oh gosh, what is NATO Secretary General Jens Stoltenberg going to say about this? !” I’d never have gotten anywhere. If Jens Stoltenberg had his way, I would’ve stopped slaughtering my own people years ago! I can’t tell you how amazing it felt to realize one day that I no longer cared who thought I should stop bombing hospitals. But this kind of revelation doesn’t happen overnight. You have to make some serious changes. For example, if there are finger-waggers around you who always voice their disapproval about you using chemical weapons, you need to send them packing. They’ll only bring you down. Cut them out of your life, then have them executed. The bottom line is this: Not letting the opinions of others get to me has changed my whole outlook. In fact, it’s changed everything. 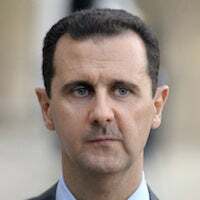 If I hadn’t altered my way of thinking, if I hadn’t learned to trust myself, I never, ever could have presided over a brutal civil war that has led to the displacement of half of Syria’s population. Now, every day is an opportunity for new war crimes! Pay no attention to anyone who denounces the ongoing, wholesale murder of the citizens under your rule, because there’s nothing you can do to change their minds. And—you know what?—that’s okay. At the end of the day, people are usually too wrapped up in their own problems to spend much time judging you anyway. The truth is, no one really cares.